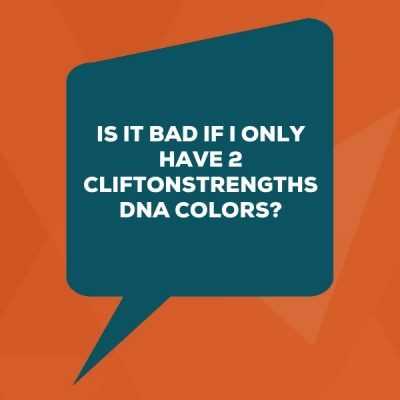 Is It Bad If I Only Have 2 CliftonStrengths DNA Colors? Today we’re exploring your CliftonStrengths Q&A with a question someone asked me in a training class the other day. He said, “Hey, I only have two of the four CliftonStrengths colors in my StrengthsFinder DNA chart. Is that bad?” My answer to this one is like that Lil Jon Song “Work What Your Mama Gave Ya.” Maybe he said Shake What Your Mama Gave Ya, but you know what I’m talking about here. It’s the best thing you can do with your lineup of talents: use the ones you have. I have to admit, I have been known to celebrate with a game-show-like moment when someone has all five talent themes in a single color. It’s usually in a big giant ballroom of people in a training class or a StrengthsFinder speech. If we have one of those royal flush moments where someone has all of the same suit (or same color in this case), it’s a fun thing to spot. When you have a room of 300 people and somebody has 100% purple executing talents or 100% blue relationship talents — it really is a rare sight, so I get excited. Then yeah, yeah, I admit it. I give out Unicorn Sticks and I make a thing of it for a second because it’s fun. Dang. I Only Have 2 of 4 Colors. Surely I Need Those Other Ones. Most often, what happens is that people say, “Oh Dang, I only have two of the four, so I’m probably missing something really important that I need.” Or, “Oh man, I have three, but I really need that 4th color for the job I’m in right now.” To know what to do here, you really have to go back to that concept of working with what you have. It’s almost like that scene from Pretty Woman where she’s saying, “Work it! Own it!” You have what you have. So instead of trying to go back to game the assessment by retaking it to get it to say what you want, look at the ones that you do have and figure out how to use those to meet those very same demands. I’ll give you an example from my personal lineup of all 34 talent themes. Of the Top 14, I have 1 executing talent. So you would read that and think, just like participants do in my training sessions, “Oh no, I’m not going to ever get anything done because I only have one executing talent out of my top 14.” But the thing is I do get things done. Focus is the only talent theme that is in my top 14. And so yes, I have an easy go-to talent theme when I need to get things done. When you get the upgraded CliftonStrengths 34 Report, you can see all 34 potential talent themes in stack rank order. I mention that in case you’re wondering how I know what my top 14 are. So if you get the full report, you can look to it for your easy go-to colors that represent each demand. That’s why, when I really need to get something done, I’m going to rely on my focus talent theme. That’s not the only option though. There are other things to do besides going to your obvious go-to talent. My favorite alternate option is to think of all 4 of those demands with all of your talent themes, regardless of color. You can actually impact any of those demands through any talent theme if you stretch your brain creatively. It’s an innovative application of strengths thinking that I love to do. So that’s my action item I offer you for this question: think of 1 of those 4 demands — pick the one that is calling on you in your job right now. Let’s say I really need to get some stuff done. So I would pick the executing demand for this activity. Oops. Now I look at my top 5 and I see that I don’t have any executing talent themes to call on. I have zero purple in my top 5. This is where you have to tell yourself to not fret. I’ll give you an example by running through my top 5 and this will just demonstrate for you how you could do this for yourself. If I used my Maximizer talent in a git-r-done moment, it would be when I need high quality because my Maximizer loves to tweak and keep working on stuff. It’s fun to keep making it better. For an execution situation where I need to get a lot of decisions made fast, I would rely on my Strategic talent. It helps me sort out what the options are quickly, then pick a path, and then press the go button. Although it’s technically in the thinking talent domain, Strategic allows me to get moving and not belabor the thing or have buyer’s remorse. If I needed to execute on something and I wanted to use my Positivity talent, it would likely be on one of those crap tasks that you hate doing, yet you also don’t want to waste your time bellyaching about things. So Positivity could make light of it or find a silver lining in it. It helps me reframe and move on. Woo would be great if I’m collaborating with some new people and we need to get to know each other. Or maybe there’s a task that has to do with spreading an idea. The Woo talent loves to get the word out — and that would be a great way to execute on an organizational change. After you pick 1 specific demand that you’re getting called to do in your work, run all 5 of your talents through that single demand. See how they could support you in that endeavor. It’s a really cool way to stretch your talent themes and think of them in a way you haven’t used them before. I hope you really enjoy that way of looking at talent themes with a new lens. Instead of lamenting what you don’t have, love and leverage what you do have. Now get on out there, claim your talents and share them with the world — no matter what color they are!